This is the meal D and I had for Christmas Day dinner. Coincidentally, it was so good and there was enough left over that we had it again tonight! I said to D, after scooping the last bit in my bowl onto my spoon, “I don’t know how anyone could not like collard greens.” Sure, where I’m from in the South, collard greens are a sloppy, almost brown in color, inedible side dish served in some generic chain restaurant (like Cracker Barrel), and most people I know wouldn’t touch ’em with a ten foot pole. But, I betcha if they’d all try it like this, their opinions would change. I know mine did. The currants in the dish add a lovely, nice, sporadic touch of sweetness. Do you have a recipe for this? Thanks! The usual way I sauté any green is to heat a little olive oil in a pan over medium heat. I toss in a sliced garlic clove and a pinch of red pepper flakes. Then when they start sizzling, I add a bunch of greens that I have de-stemmed and sliced into ribbons. Toss that all around in the pan and then add about 1/4 cup of water or broth and toss in a handful of raisins. Cover and let cook until wilted and soft, but still dark green in color. The polenta was simply according to box instructions, just as you would make some grits. For the canellinni beans, I’d also heat up a little bit of olive oil and sauté some onion and garlic cloves till they were soft and then add a 15-oz can of the beans that have been drained and rinsed. Heat through. 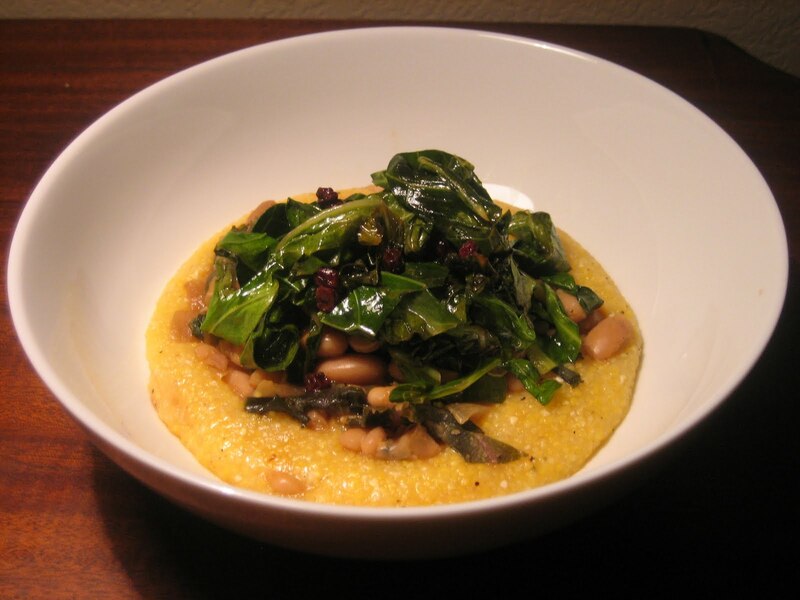 Ladle some polenta on a plate and then add some beans and top with the greens. Hope this helps, this was posted by H before I started posting my recipes.